On November 5th 2014 the Aeronautic Society of the Liaoning Province will celebrate its 50th years anniversary. 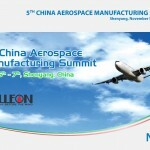 For the occasion, the 5th China Aerospace Manufacturing Summit will be hold in Shenyang from November 5th to 7th 2014. The forum intends to boost the major special projects of China’s commercial aircrafts, share insights for latest technology trends and standards, new requirements and challenges in the aerospace industry. The event is organized by Galleon, a partner of the Italian Aerospace Network.